As many of you know I’m an avid bowhunter and now that September is here, hunting is in full swing. One of my favorite parts about hunting is being able to spend time with my “second” family, the Kuiack’s. After coming in for a visit, Heather (my other mom) sent me home with TONS of pickles from her garden and this fabulous recipe for sweet pickles that came from a neighbor of theirs. These pickles still have a slight crunch, a perfect sweet and vinegar-tart taste and would be great served with crackers and cheese or on your favourite sandwich.. Let’s get to the recipe so you can enjoy these easy, deliciously sweet pickles. 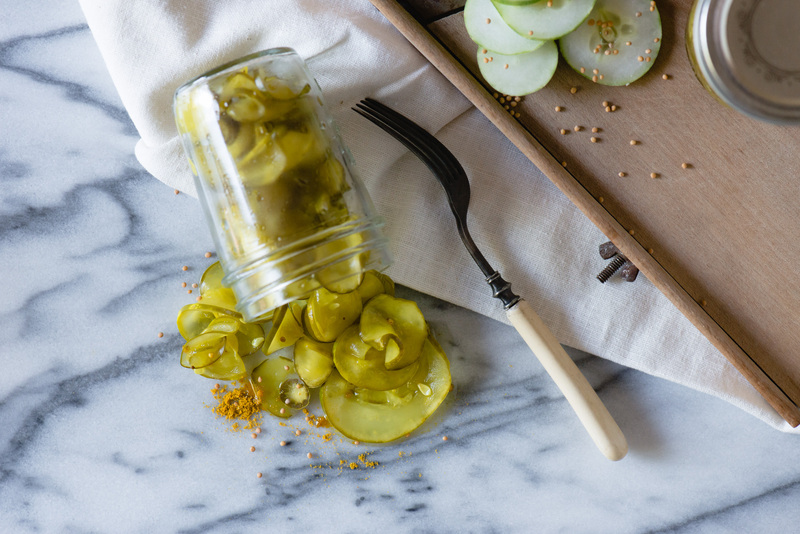 An easy recipe for sweet pickles. Perfect for serving with crackers or with sandwiches. Thinly slice cucumbers (roughly thinness of a dime to a quarter), pour course salt over and cover with cold water. Let sit over night. After allowing the cukes to sit over night, drain and set aside. In a large pot, combine your sugar, vinegar, mustard seed, celery seed, turmeric and clove. Bring syrup to a boil. Pour drained dukes into hot syrup. Heat throughly but do not boil. Put into jars and seal. Thanks to Bob for trading photos for pickles. Do you need to peel the cucumbers before slicing? How long do I let them sit before they’re good to eat? You can eat them immediately! Of course, they will become more pickled the longer they sit. Carlene – how many jars would this make please? I am going to try them out this weekend. It made about 30, 8 oz jars! Everyone is getting pickles for Christmas from me! When you mention at the end to seal the pickles are you meaning to boil them in a canning pot or just put the lids on since the syrup is already boiling? Just put the lids on!